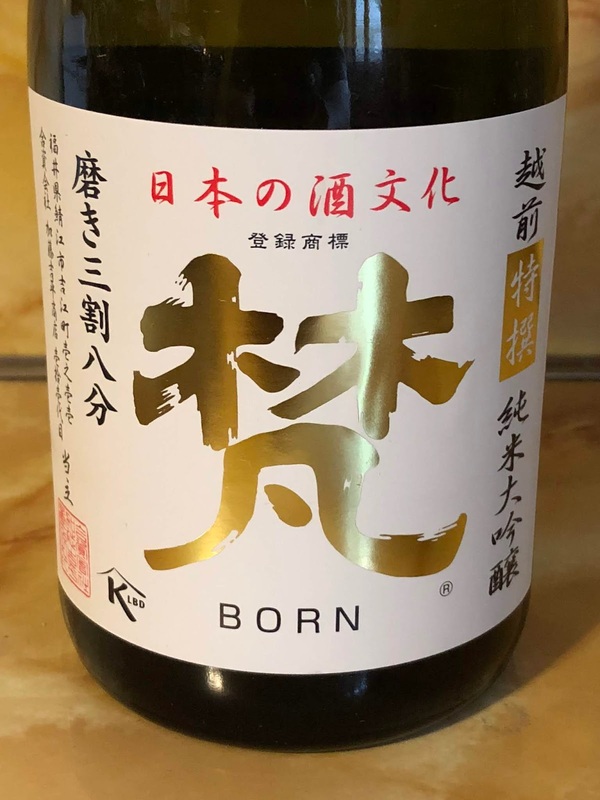 The Born brand is produced by the Kato Kichibee Shoten brewery,which is located in the Fukui Prefecture and was established in 1860. The company originally was involved in money exchange, but eventually the village headman chose to enter the Sake business. They use the term "Born" as in Sanskrit, it is roughly translated as "purity/striking truth, and represents the brewery's strong belief in second changes and karmic rewards for hard work." During the early Showa era, which began in 1926, the Born brand was drank at imperial ceremonies, festivals, and presented to special guests. The Born Tokusen ("Special Selection") Junmai Daiginjo ($57) is produced from the highest quality Yamada Nishiki rice from Special Region “A” in Hyogo Prefecture. The rice was polished down to 38%, a significant amount less than the 50% minimum required for a Daiginjo. It also possesses a Sake Meter Value of +5, Acidity 1.3, and a 16% ABV. What helps to make this Sake more unique is that it was aged for at least two years at 32 degrees Fahrenheit, the freezing point of water. Very little Sake is aged like that, but I've found such aging can add more complexity to the Sake. The aroma of this Sake was alluring and seductive, with rich fruit smells, floral accents and hints of spice. And on the palate, the complexity of its taste thoroughly impressed. There was a rich mouthfeel, an intense depth of flavor including tastes of citrus, melon, grapefruit, pear, vanilla, and licorice. It was silky smooth and elegant, with a lengthy, pleasing finish. Every sip brought something new to my mouth and made me crave the next sip. This Sake paired great with seafood though I could easily see it pairing well with other dishes as well, from cheese to chicken. A superb Sake at a very reasonable price considering its high quality and taste. Highly recommended!